The Adaptive Integration framework simplifies and automates integration across multiple data sources, whether you’re importing a spreadsheet or directly integrating data from your cloud or on-premises business apps. Our pre-configured, click-not-code integration speeds connectivity to ERP and CRM systems so that you always have the latest data at hand. In-memory technology underpins Adaptive Insights planning, consolidation, and analysis, providing real-time calculation and aggregation across metrics, dimensions, and business structures. Based on cloud standards, our relational database store ensures the utmost data integrity as well as a level of reliability that proprietary data stores simply can’t deliver. Successful performance management requires that everyone be on the same page. Our process tracker makes it simple to track tasks, share status updates, monitor progress indicators, discuss issues, and close tasks. Better yet, it’s accessible from any device, at any time. Created for the cloud from the ground up, Adaptive Insights applications are accessible from anywhere and from any browser. Responsive design lets managers plan and analyze using their tablet of choice—optimized for any form factor. Our native iOS app for Adaptive Discovery puts dashboards in the hands of managers and executives when needed most. Every department and subsidiary in your organization has different needs. That’s why we created our unique multi-instance technology. You can deploy multiple distinct planning models to meet individual functional needs, while never losing the integrated and consolidated perspective. With Adaptive Insights, you can easily manage what users can see or change, whether that’s dashboards, reports, sheets, calculations, or individual cells. Create once, and our security model does the rest. Standards-based single sign-on makes secure access to Adaptive Insights easy, while SSAE 16, EU-US Safe Harbor, and TRUSTe compliance ensures your peace of mind. A web browser is all that’s needed to use the products in the integrated Adaptive Suite. There’s no hardware to install, and no on-premises, database, or operating system software. You and your IT team won’t need to install patches or upgrades because upgrades are managed by Adaptive Insights and occur automatically. *The Extended Support Release (ESR) is an official release of Firefox for desktop for use by organizations, including schools, universities, businesses, and others who need extended support for mass deployments. • The latest release of Mozilla Firefox and the latest ESR* release of Firefoxr. *Dutch translations are done by Adaptive Insights partners, so there may be discrepancies in the way text is presented or areas of the application where translated text is unavailable. All text in the user interface is displayed in the user’s language. Numbers and dates on sheets and reports are displayed in the appropriate format for the user’s locale and users can enter, store, and display data in their language. Users can enter textual data in any language, including accented characters and ideographic characters (such as in Chinese and Japanese). All entered text will be displayed correctly. Adaptive Insights is committed to delivering world-class customer service. This includes not only delivering top-notch uptime, but also publicizing our actual performance. 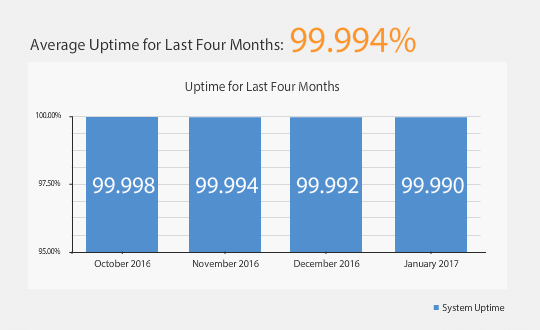 This chart displays uptime, measured as a percentage of time the hosted service is available, excluding scheduled maintenance. 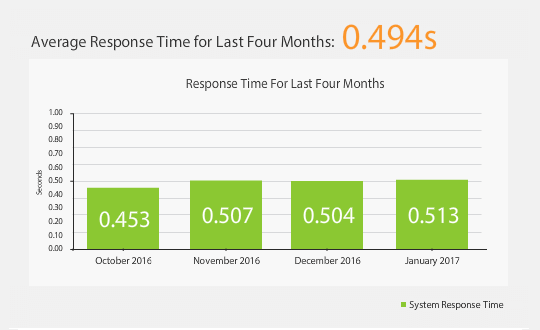 Adaptive Insights monitors and measures server response times of our hosted service using a third-party tool, and also runs continuous automated 24- and 48-hour performance tests. This chart displays length of time, in seconds, that our server spends evaluating user interactions. Adaptive Insights provides a range of connectivity options allowing customers to seamlessly leverage the Suite’s cloud data integration platform. Adaptive Insights’ pre-configured adapters enhance user control and autonomy, are purpose-built to accelerate time to market and minimize ongoing cost of ownership. The data integration platform allows for an ‘extract once, load (data) anywhere’ capability across all Adaptive Suite applications. In addition to the portfolio of pre-configured adapters, Adaptive Insights also provides rapid time to value with a ‘purpose built’ cloud adapter that allows access to any cloud source API targeting the Adaptive Suite applications. GL and CRM adapters such as those pre-configured for NetSuite, Salesforce, Microsoft Dynamics GP, and Intacct, enable automated, accurate data imports between Adaptive Insights and the source system. Pre-configured adapters are ideal for customers wanting automated data extraction and self-service preparation ability – from automating imports, with most commonly used tables exposed, auto-mapping of Adaptive-built custom objects to the source GL system, scheduling tasks, application of business rules and the ability to handle multiple entities within the source GL system. See the Adaptive Integration data sheet for more information.